Talk all you want about GB here. Numero uno muli ang pagpapatawa ng "Goin' Bulilit" nang makapagtala ang unang Malaysia episode ng kids ng rating na 25.1% average audience share noong nakaraang Linggo (November 11). Tinalo ng "Goin' Bulilit" ang muling nagbabalik na "Pepito Manaloto Ang Tunay na Kuwento" ng GMA matapos makakuha ang huli ng rating na 20.1% base sa urban and rural audience measurement data ng Kantar Media. Samantala, ipapalabas ngayong Linggo (November 18) ang ikalawang parte ng two-part Malaysia Special ng kids kung saan sa Lego Land dadalhin ng mga bulilit ang katatawanan. Abangan ang kanilang gags na "Legoland", "Ang Corny", "Mutya-Cha" at "Kursunada sa Malaysia". Ipapasyal naman ni "Nora the Explorer" ang mga manonood sa magagandang lugar sa Malaysia habang magpapasiklaban sa isang pageant ang mga cute na kinatawan nina Ms. Philippines at Ms. Malaysia. Abangan rin ang kanilang "Kilala Mo Ba Ako", "Picture" at "Sunway Lagoon" at maki-indak sa kanilang redisyon ng awiting "My Sharona". 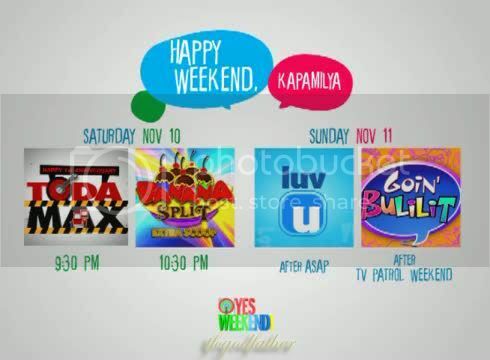 Mamasyal sa Malaysia kasama ang "Goin' Bulilit" ngayong Linggo (November 18) pagkatapos ng "TV Patrol Weekend" sa ABS-CBN. Laughter with the “Goin’ Bulilit” kids is definitely number one as proven by their rating of 25.1% average audience share last Sunday (November 11). “Goin’ Bulilit” retained its spot by beating GMA’s returning “Pepito Manaloto Ang Tunay na Kuwento” that received only a rating of 20.1% based on the urban and rural audience measurement date of Kantar Media. Meanwhile, the second Malaysia episode of “Goin’ Bulilit” will air this Sunday (November 18). 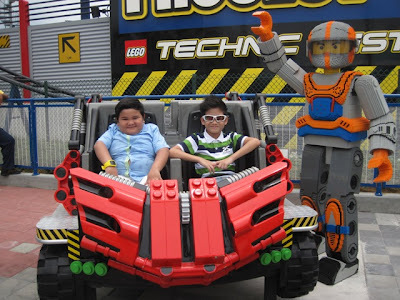 The kids will bring their viewers to Lego Land where they will deliver their gags “Lego Land”, “Ang Corny”, “Mutya-Cha” and “Kursunada sa Malaysia”. Cute adventurer “Nora the Explorer” will take everyone to a fun-filled tour in the must-see spots of Malaysia while two cute candidates, Ms. Philippines and Ms. Malaysia will try to outdo each other in a hilarious showdown. Also watch out for their sketches “Kilala Mo Ba Ako”, “Picture” and “Sunway Lagoon” and dance along the kids’ rendition of the song “My Sharona”. 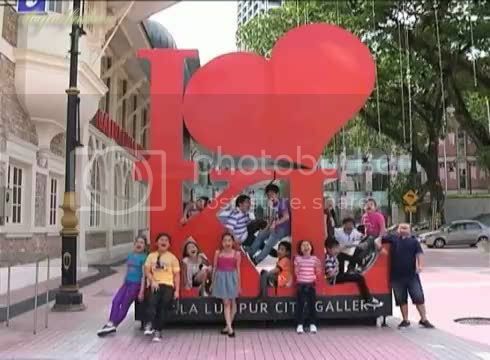 Travel Malaysia with “Goin’ Bulilit” this Sunday (November 18) after “TV Patrol Weekend” on ABS-CBN. Get tips from the cute sales clerks of “Goin’ Bulilit” (GB) through their “Appliance Store Gags” this Sunday (November 25). Apart from securing a lot of sales, the kids will also scrutinize Philippine bills to find out how to distinguish fake ones on their “Pekeng Pera Tips”. Also watch out for the bulilit trademarks “Ang Corny” and “Tanong ko Lang” and join the riot in “Bayaw, Bilas, Balae”. Also don’t miss their generous sketch “Pahingi” and their hilarious rendition of the break-up song “Somebody That I used to Know”. The fun-filled gag show will end through a riotous “Closing Game”. Meanwhile in the ratings game, laughter with the GB kids is still number one as their second Malaysia episode last Sunday (November 18) registered a rating of 23.2% average audience share compared to its rival show from GMA “Pepito Manaloto ang Tunay na Kuwento” which only received a rating of 20.1% average audience share based on the urban and rural audience measurement data of Kantar Media. 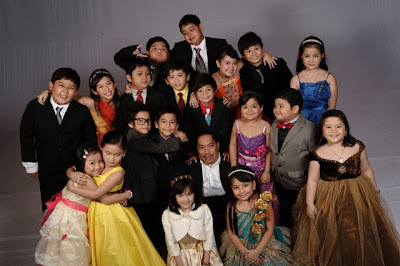 Watch the leading gag show every Sunday, “Goin’ Bulilit” on November 25 after “TV Patrol Weekend” on ABS-CBN. GB could add something else to the show. I love the song in the beginning... maybe have newer kids or open auditions on the show. Join the caroling fever on “Goin’ Bulilit” this Sunday (December 2) as they present the gags “Karoling sa Jeep” and “Karoling sa Bahay”. The singing won’t stop after the Christmas carols as the kids will spoof the song “Lumiliwanag ang Mundo sa Kuwento ng Pasko” and will make their own version of the popular ABS-CBN News and Current affairs program which they will call “Ako ang Simula…ng Pila”. Naughty bulilits won’t go unseen meanwhile on the sketch “Walang ma-CCTV”. Also watch out for their signature gags “Ang Corny”, “Tanong Ko Lang” and the newest sketch “Ooh! Eew!” The kids will conclude the fun through a riotous “Closing Game”. Meanwhile, laughter with the “Goin’ Bulilit” kids still rules when it comes to ratings when the kiddie gag show received a rating of 23.7% average audience share last Sunday (November 25) or four points higher than rival show “Pepito Manaloto ang Tunay na Kuwento” of GMA which only received a rating of 19.3% based on the urban and rural audience measurement data of Kantar Media. Sing-along with today’s popular Christmas tunes with “Goin’ Bulilit” this Sunday (December 2) after “TV Patrol Weekend” on ABS-CBN. MANILA, Philippines -- The Kapamilya network maintained its lead in national TV ratings in November, as it took 13 of the 15 spots in the list of most watched programs nationwide. (above), leads the top-rating Primetime Bida block of ABS-CBN. After posting a 10-percentage point lead in nationwide ratings over its nearest competitor in October, ABS-CBN again achieved the feat last month, according to the latest TV ratings data of multinational market research group Kantar Media. For the month of November, the Kapamilya network garnered an average national audience share of 41%, while GMA-7 only turned in 31%. Primetime Bida, ABS-CBN's evening offerings that air between 6 p.m. and 12 midnight on weekdays, posted a sharp lead over its counterpart on GMA-7 in November. Kicking off with the teen-oriented fantasy series "Aryana," Primetime Bida garnered an average TV viewership of 47% across the country, while GMA-7 and TV5 only managed to get 29% and 11% respectively. 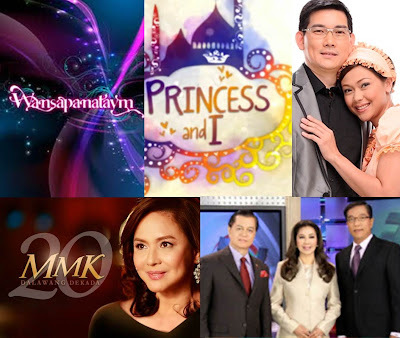 Three of ABS-CBN's primetime programs were in the Top 5 most watched programs nationwide last month -- with "Princess and I" in second (average nationwide rating of 32.8%); "Ina, Kapatid, Anak" in third (32.2%); "TV Patrol" in 4th (30.8%); and "A Beautiful Affair" in 15th (19.4%). Led by the top-rating romantic-comedy series "Be Careful With My Heart," ABS-CBN's daytime offerings -- those aired between 6 a.m. and 6 p.m. on weekdays -- garnered an average TV viewership of 38% nationwide in November, compared to GMA-7's 33%, and TV5's 14%. The "kilig-serye" starring Jodi Sta. Maria and Richard Yap was also among last month's Top 10 most watched programs nationwide, with its 25.1% average national TV rating, good for No. 9 on the list. Joining "Be Careful With My Heart" in the list of most watched TV shows in November are ABS-CBN's weekend offerings "Wansapanataym" (No. 1) "Maalaala Mo Kaya" (No. 5), "Kapamilya Deal or No Deal" (No. 7), "Goin' Bulilit" (No. 9), and "Rated K" (No. 10). Looks like Queenie is gone for some reason. Is Blythe no longer part of the show too? I know she's a regular on a GMA soap. Hope she's still a Kapamilya. Hope Kobi is gone permanently. He didn't deserve to be the final remaining cast member of the original batch of GB. He stayed longer than Nash and Sharlene which makes NO SENSE! ABS-CBN dominated nationwide TV ratings for the month of November by virtue of its weeklong top-caliber primetime offerings that continue to gain significant increases as more and more viewers watch them on both weekday and weekend nights. Out of the top 15 top running programs in November, ABS-CBN took 13 spots and secured the top 11 spots. “Wansapanataym” soared high and led the pack with a national TV rating of 36.4%, while “Princess and I” remained strong at 2nd place with 34.2%. “Maalaala Mo Kaya” remained as the country’s number one drama anthology with a national TV rating of 29.4%, almost twice rival program’s “Magpakailanman” that only fared at 16.8%. The undisputed leading daytime program “Be Careful With My Heart,” meanwhile, zoomed into November’s top 8 from last month’s top 14. The Jodi Sta. Maria-Richard Yap starrer strengthened to a national TV rating of 25.1% from October’s 23.3%. The other ABS-CBN programs in the top 15 include “Ina Kapatid Anak” (32.2%), “TV Patrol” (30.8%), “Aryana” (26.6%), “Kapamilya Deal or No Deal” (25.7%), “Goin’ Bulilit” (24.5%), “Rated K” (23.1%), and “TV Patrol Weekend” on Sundays (22.3%) and Saturdays (20.4%), and “A Beautiful Affair” (19.4%).